What makes a hiking boot great? How do you chose footwear for comfort, protection, and durability. 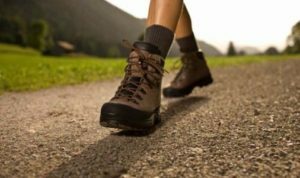 Day Hiking (Light-weight)- Do you usually go for short hikes for one to several hours? During the week or weekend without a backpack? Then you’ll want to consider these. They’re lighter,flexible, and breathe better because they’re usually made of fabric and split-grain leather. They’re comfortable for day outings. But you’ll become fatigued and your feet will begin to bother you if you try to hike with a pack or for an extended trip. Because they aren’t designed to support you like the hiking boots. Backpacking/Hiking (Mid-weight)- Stiffer mid-weight hiking boots provide more support and protection for shorter 2-3 day trips or even day hikes with or without a light to moderate load. If you hike for a few hours and want more support and/or up to three days on or off-trail on easy to moderate trails get a mid-weight leather backpacking boot. Extended Backpacking (Mountaineering)- The best level of support, protection, and durability for heavier loads and longer trips. But they’re also usually heavier. Supports heavy loads of approximately 40+ pounds (could vary with hiking boot). If you hike for more than three days on or off-trail with a moderate to heavy pack on demanding terrain get an extended (heavy weight)backpacking boot. If you need to attach crampons for glaciers check to make sure the boots are compatible before you buy. For cold-weather hiking it’s critical to get waterproof insulated boots that breathe to keep you dry. Full-grain leather and Nubuck suede take water repellent products well but keep in mind that they won’t waterproof a hiking boot NOT designed to be waterproof in the first place.The repellent will help shed water but if you’re walking through streams or deep puddles you’re going to get wet. You may or may not need waterproof hiking boots. Consider the environment you usually hike in and how long your trips are. If you do a lot of short desert hiking trips you probably don’t need waterproof boots. Actually in a dry environment they’ll only make it harder for your feet to breathe (more numerous or heavy layers mean less breath ability). Nylon mesh fabric breathes better than leather, but remember you’re making trade offs for durability, support, and protection. This is the perfect way to break down this inotimaorfn.